Today I wanted to share with you a tutorial and blanket scarf guide! Blanket scarves are one of my very favorite accessories, and I get a lot of questions about where I get mine and how to wear them. It can be a daunting task to figure out how to fold such a huge scarf, and make it look normal on your neck. I've included a few different ways to wear your blanket scarves and links to many of the scarves I have and where you can get them. Most of them are around $30 and they make PERFECT gifts! Step 1: Unfold your scarf completely. Step 2: Fold your scarf into a triangle. You can fold it once or twice depending on how large it is and how big you want it (I usually fold mine just once). Step 3: Starting from the front, wrap the corners of the scarf back around your neck and pull back to the front. Step 4 (optional): Fold the bottom corner up around the rest of the scarf so it does not hang down so low and looks more circular. This scarf can be found here. The second style is quite easy. All you need to do it twirl/wrap the scarf around itself (starting with the folded triangle) and simply wrap it around your shoulders. Until it is REALLY cold, this is usually the way I end up wearing it while I teach. I start off like style one and then get warm after chasing around after first graders all day. The third style is for blanket scarves that are rectangular instead of square. Simply start the scarf in the front and wrap it around your neck and come back around the front. 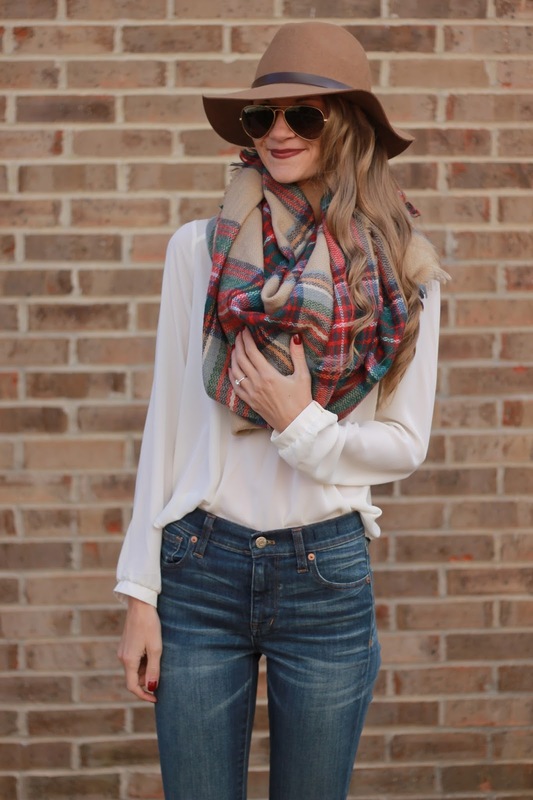 The fourth style is similar to the second, however you do not wrap the scarf around itself you leave it in the large triangle shape and drape it around your shoulders. This gives your scarf more of a cape look. The fifth style is taking the cape look one step further and wrapping one side around the front of your neck, leaving the other side hanging (see below). These are pictures of different scarves I'm loving right now styled the same five ways I described above. Here is a complete list of all my favorites and where to get them! 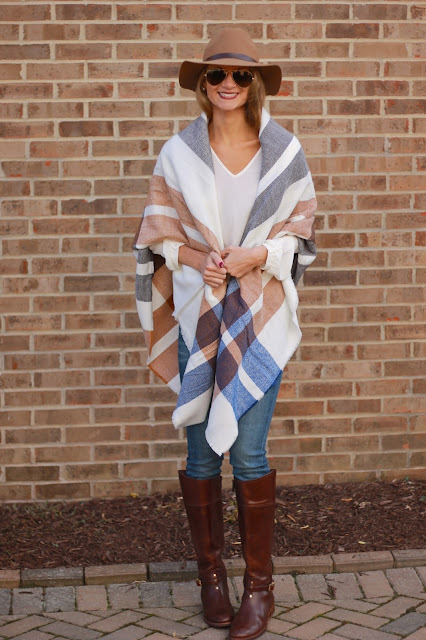 Happy blanket scarf wrapping & shopping!